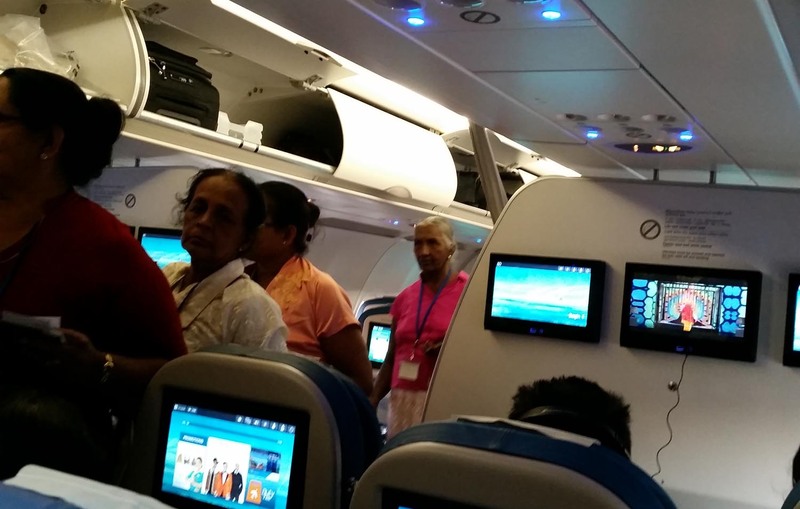 This year I had the opportunity to take Sri Lankan airlines for the first and second times. 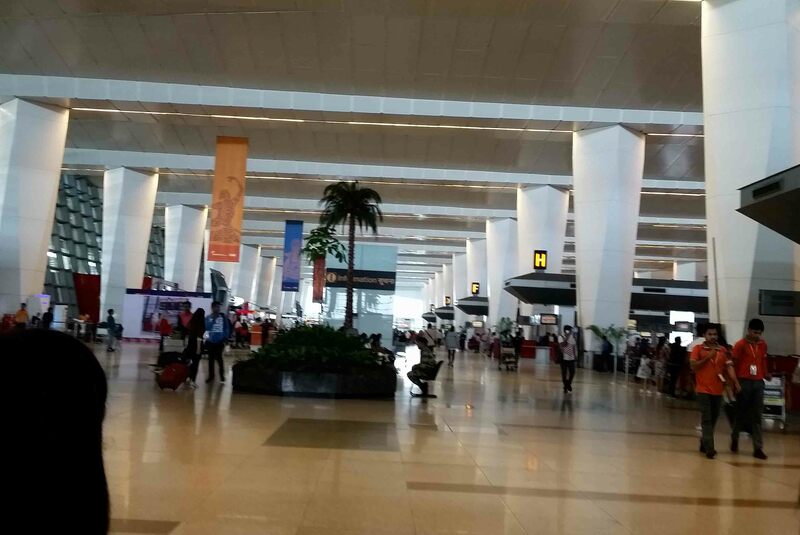 I flew from Delhi to Colombo and from Colombo to Melbourne. Sri Lankan Airlines is a full service airline based in the Sri Lankan capital of Colombo. And if you want a direct service to or from Australia, well, it’s your only option. Which certainly beats having to navigate a stop somewhere in SE Asia which could have you stuck or missing a connection. Or probably not, but you know, things happen sometimes! Sri Lankan Airlines is building a reputation at the moment, and becoming a popular choice for those visiting Sri Lanka or connecting to 105 destinations with a fleet of Airbuses. From and Australian perspective it flies into Melbourne, Sydney, Adelaide, Perth and Brisbane. So how was my experience? Well let’s start with my first flight from Delhi to Colombo. Checking in wasn’t as smooth as I might have hoped. I arrived in plenty of time, to find each check in was taking quite a while. Mine was no different. For the first time ever I was asked to produce the credit card I had used to book the flight. It just so happened in this case I had closed the card in January, I’d bought the ticket 3 months earlier. So I couldn’t produce it. I explained the situation to them and they needed to get some special authority to exempt me, which took around 30 minutes. 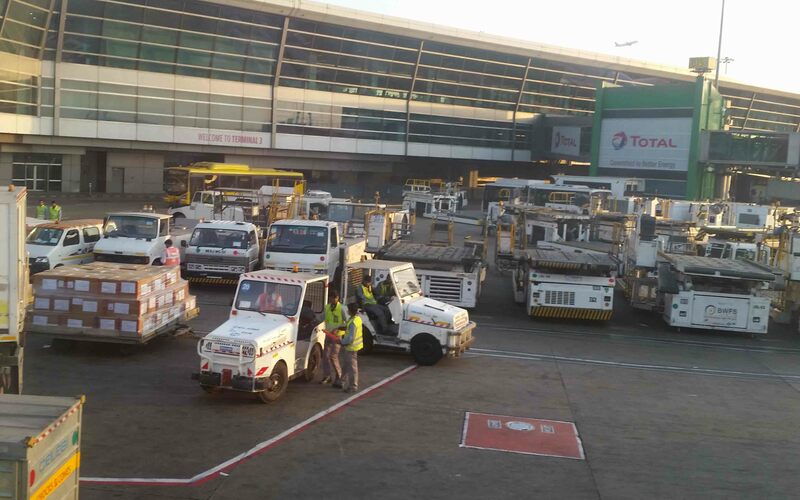 On the ground at Delhi Airport. Then there were issues with batteries. From Australia there is a ban on lithium batteries in checked luggage, from Delhi there seem to be issues with all batteries including Alkaline batteries. And that took time to resolve as I had quite a few with me – I always bring them just in case. They took half of them off me. I’m not really sure why but it’s not really a Sri Lankan Airlines issue I guess, more a security in the region issue. The flight from Delhi to Colombo. 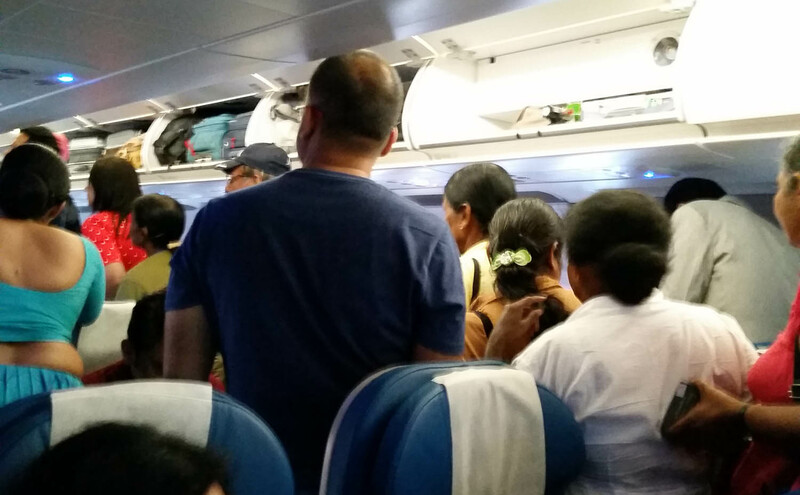 It was pretty full, and you’d think that would be one of Sri Lankan Airlines’ most popular legs. Airbus 321 with 3 seats either side of the aisle. The flight was just over 5 hours long and that’s about as long as you’d like in that configuration really. I find that despite better legroom that your budget airlines, any plane in a 3 – 3 formation feels a bit cramped and you feel a bit trapped. I noted in the diary that the legroom was similar to Air Asia. But – we were on time. 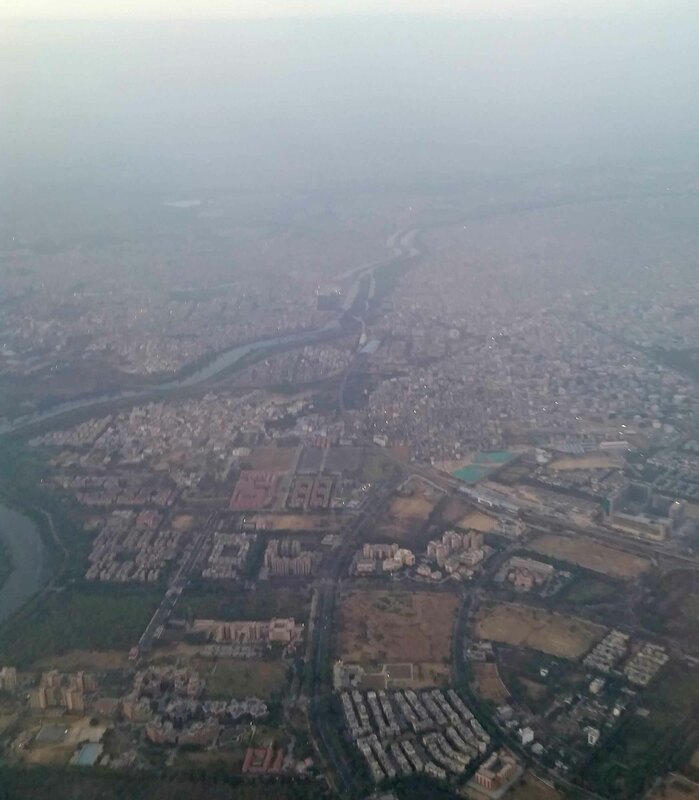 It was a surprisingly smooth flight compared to others I’ve taken in the region. And the nightime views were really cool as the sun set over India. 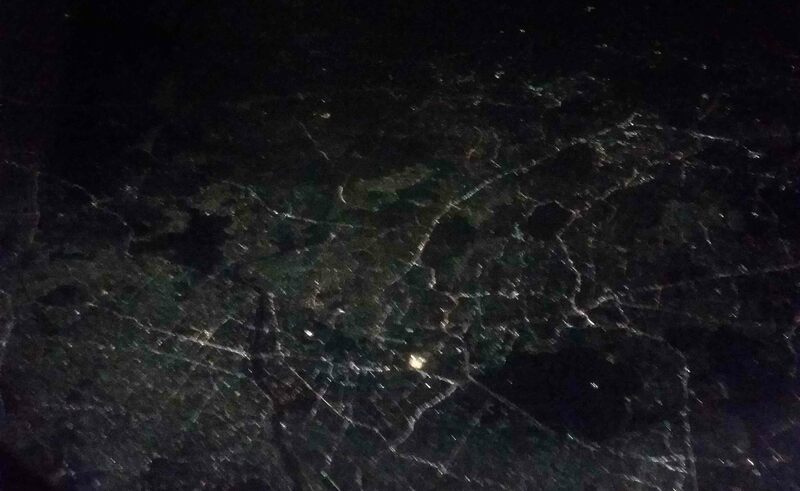 I looked down below and there was Hyderabad all lit up a couple of hours into the flight. I’d made the mistake of booking the non-vegetarian Hindu meal when booking. It was presented, as far as I could see, as that you had to make a choice. Apparently leave it blank and you get the normal meal, I didn’t think there was a ‘normal meal’ as it were. The food though was of the region, but not spicy and decent. Not amazing by any stretch of the imagination, but not ‘bad’ either. Two and half weeks later I was returning home from Colombo on Sri Lankan Airlines again. Colombo Airport, I should mention, is decent for what it is. It’s a long way from being one of the world’s great airports, and a Burger King meal there was like $17US (I think it’s fair to say anything you buy there was severely overpriced! ), but it’s a fair size and coming into Sri Lanka was easy to navigate and there weren’t long waits at immigration or baggage claim despite it appearing quite busy. Flying out, well, it’s a little more chaotic and the queue to check in seemed to take an unnecessary amount of time. And there would be people on the counter of business class and online check in with no-one in the queue and they would just sit there with the economy check-in line extremely long. Eventually, after a long time, they were directed to some of the people, and then they pulled people from way down the line. Maybe I’m just OCD but this just did my head in. The plane back to Melbourne was an Airbus 330, and the configuration was 2 – 4 – 2 and my wife and I had two seats on the right hand side of the plane. Good legroom, not a bad flight. 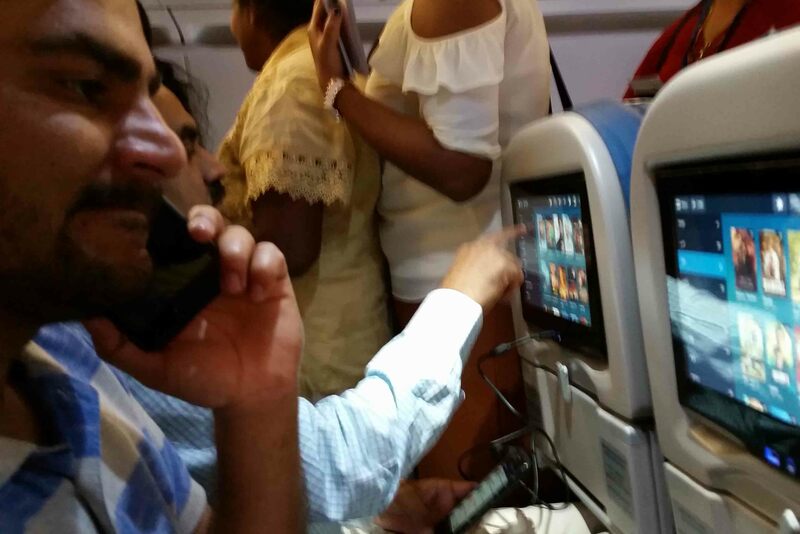 The flight was around 2/3 full. Which probably doesn’t mean that the airline made any money on the flight, but a bit of space sure helps. On both flights the service was good. Pleasant, dependable but not outstanding. Food was good too on this flight, better than the flight from Delhi. Entertainment on both flights was a screen in the back of the seat, and the choice was okay but a little limited compared to other full fare airlines. So, how do I rate Sri Lankan Airlines? Well, pretty good all said. Good destination choice, solid service, comfortable flights, it’s not the most brilliant airline in the world, but it’s better than a lot of them out there. Pricewise, it was less than $1000AUD for return flights for my wife Melbourne to Colombo, and that’s a direct flight, which is only a recent thing. So price-wise, it’s not much more than taking budget airlines, for a lot less hassle. Yeah, I was happy to take Sri Lankan Airlines. Have you ever flown with Sri Lankan Airlines? How did you find them? Please comment below! And… May the Journey Never End! I have – from Chennai to Colombo, then from Colombo to Bangkok. Both good flights, although rather short, the check in at Colombo was a nightmare though – for much the same reason as you said. Yeah they need to sort that out! Thanks for commenting!